Call today to book your Invisalign consultation! Transform your smile with our gentle, safe & pain-free teeth whitening system! Going to the dentist doesn’t need to be painful! Not only are we a pain free* clinic. We can take the pain out of paying for your new smile with our finance options. Are you looking for the best in cosmetic dentistry? Get in touch today with our team and find out how easy it is to transform your smile! Book your dental implant consultation package for only £99 usually worth £499. Contact our award winning team today! Our gentle cosmetic procedures will create the radiant smile you have always wanted. We always put your needs first and will create the perfect plan for what you would like to achieve. A warm and friendly welcome to the Berkeley Clinic website. Are you looking for a cosmetic dentist in Glasgow? Did you know that the Berkeley Clinic is one of the most technologically advanced and award winning dental centres for cosmetic and restorative dentistry in Scotland and UK? You can rest assured that you will get the best dental care, because our clinic has been awarded a number of prestigious dental industry awards including winner of "Dentist of the Year 2018" and winner of "Cosmetic Clinic of the Year 2018". Would you like to have a healthy and beautiful smile? Have you ever thought about veneers? Just watch a video below of one of our happy patients, a former Miss Scotland, Jamey Bowers and her dazzling new smile. The Berkeley Clinic is set in a B-listed Georgian town house originally built in 1864 and is located in Glasgow, only two minutes away from the M8 motorway and the Mitchell Library. The practice provides all aspects of advanced cosmetic dentistry including smile makeovers, dentures, dental implants, teeth whitening, clear braces, crowns, veneers, teeth straightening and safe amalgam removal. Why choose dental care at the Berkeley Clinic in Glasgow? Our award-winning care team have created a comfortable and relaxing environment that promotes the well-being of our patients. By utilising state of the art technology and techniques we are recognised as one of the most advanced private dental centres in Scotland and the entire UK. You will smile when you realise how affordable it can be to achieve the best possible results in cosmetic dentistry. We treat patients from all over the country including Glasgow, Edinburgh, Ayr, Falkirk, Stirling, Dundee, Aberdeen, and London. We aim to improve our patient’s health and well-being from both functional and aesthetic standpoint. Helping people become more confident, healthier and happier remains one of the most rewarding parts of what we do. If you are looking for the best dentist or dental care in Glasgow contact the Berkeley Clinic and our award winning team will take good care of you and your oral health needs. Do you have a dental anxiety or fear? We understand that patients may have various dental anxieties. A number of features of the Berkeley Clinic design have been specifically designed by Dr Mike Gow, an award winning dentist with a wide range of experience in dental anxiety management. Dr Gow has postgraduate qualifications in hypnosis, sedation and NLP. Mike has studied and developed the best techniques to look after anxious or phobic dental patients which culminated in the prestigious winning of the ‘Best Treatment of Nervous Patients UK'. Our clinical team is highly experienced in helping patients to manage and overcome their dental anxieties, fears and phobias. So, if you have dental anxiety or are scared of the dentist contact us today and see how we can help. Did you know that we can get your teeth fixed in a day? Did you know that the Berkeley Clinic is partnering with a highly professional in-house dental lab which allows us to deliver most services in a single visit including veneers, and crowns? Having a dental technician on the site helps us to provide and deliver customised dental services to best suit your dental needs. We use the most advanced dental technologies such as Cerec 3D, Cerec Omnicam and Sirona xG 3D which enables our team to carry dental procedures more accurately and efficiently. We provide facial rejuvenation, dermal and lip fillers, wrinkle reduction, thread vein removal and anti-snoring. If you would like to find out more about aesthetic and medical treatments at the Berkeley Clinic in Glasgow contact us on 0141 564 1900. Take a Virtual Tour and see the Berkeley Clinic at the comfort of your own home! We have created a special virtual tour to show you the premises of the clinic. Simply follow the arrow which moves around and click to the direction where you would like to go. 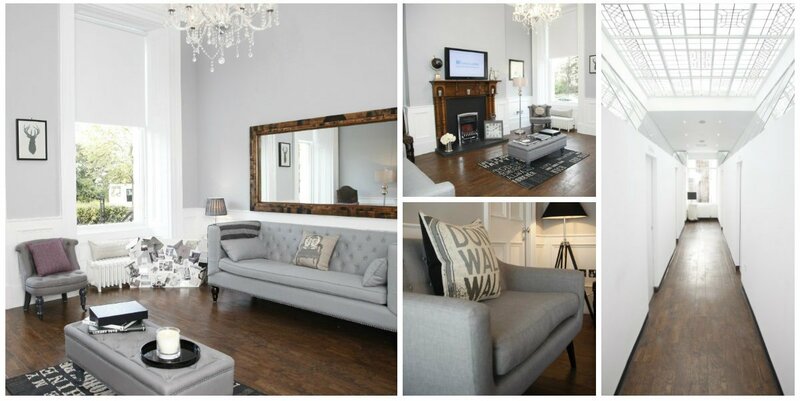 To see the virtual tour of our dental clinic in Glasgow simply click here. The Berkeley Clinic dentists in Glasgow have successfully been treating patients for over a decade. The most popular dental treatments at the clinic include implants, teeth whitening, veneers, crowns, safe amalgam removal and dentures. Our clinical team has been leading the way into the award-winning restorative and cosmetic dentistry in Glasgow. Please see some of our awards below. "Scottish Dental Awards" ... Winner of "Dentist of the Year", 2018. "Scottish Beauty Industry Awards"... Winner of "Cosmetic Clinic of the Year", 2018. "Cosmetic Dentist UK"... Winner of "Dentist of the Year", 2015. "Cosmetic Dentist UK"...Winner of "Private Practice of the Year UK", 2013. "Dental Fear Management Glasgow"...Winner of "Best Treatment of Nervous Patients", 2013, 2014. "Cosmetic Dentistry Scotland"....Winner of "Best Practice Scotland", 2012 & 2013. "Cosmetic Dentist Glasgow".... Winners of “Best Young Dentist” 2008, 2009 & 2011. "Dental Implants"....Award winning dental implant clinic in Glasgow providing an affordable implants care in one of the most advanced dental centres in Scotland. "Teeth Whitening Glasgow"....Tooth whitening and teeth whitening kits in Glasgow’s world class state of the art clinic. Find out more and contact us for a consultation today on 0141 564 1900. We are looking forward to seeing you soon.